My good friend, Amy, has written a book and I'm so excited about this one. She is such a great designer and I have many of her patterns. Paper piecing is one of her specialties, and she has designed many beautiful blocks and quilts. If you are on Instagram, you might have already seen some of these Tell Me a Story blocks popping up here and there. These blocks are all about making intentional and coordinating fabric choices to tell individual stories, and are ideal for doing a little fussy cutting to help share the story. The idea behind these blocks came at just the right time for me. Our son and daughter-in-law went through a nearly two-year-long process to adopt this precious little girl, Ella Jane, who is now nearly 2 1/2. As I thought about what kind of quilt I wanted to make for her, I decided the Books for Baby blocks by Ayumi, from her book Patchwork Please!, would be perfect. I'm in two bees, and my bee mates all made the cutest book blocks for the front. I just completed 12 Tell Me a Story blocks which will be pieced into the backing of the quilt. The blocks are about me, the Grandma who loves Ella so very much. They each give a little glimpse into things that I like, things that I want her to know about me. Favorite foods: Pizza and Mexican food. I play the piano (and even found a little piano player with red hair, just like me). I love knitting and quilting. 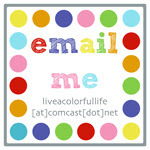 I love color, and my current favorite is orange. Disneyland is one of my favorite places to go. I love rainy days, snail mail, clocks of any kind, and would wear blue jeans every day, along with anything black and white. These are quick and fun blocks to make, and are perfect for dipping your toes into paper piecing if it has intimidated you to this point. Ready to give them a try? You can get a 30% discount off the book from the Lucky Spool web site (http://luckyspool.com/collections/books/products/intentional-piecing) using the discount code “FRIEND30”. The book is also available in Amy's Etsy shop and Amazon. 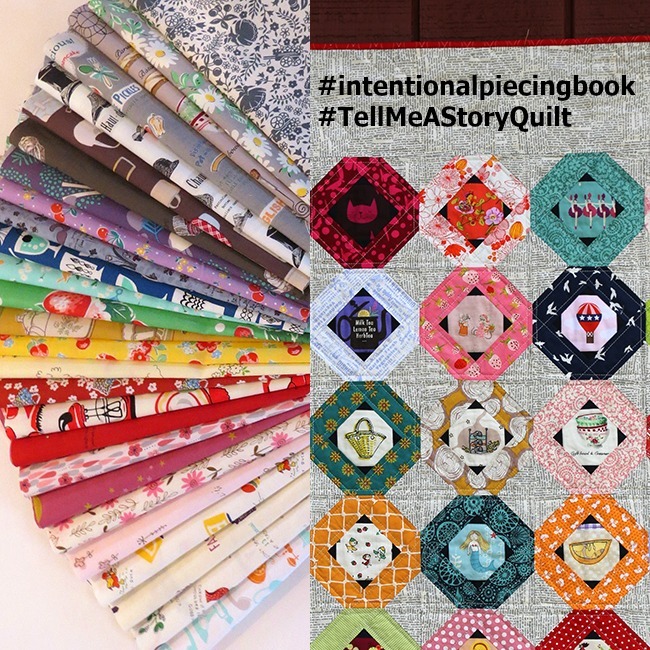 So make some blocks and post them to Instagram using the hashtags: #intentionalpiecingbook and #TellMeAStoryQuilt. For each block you post, you get a chance at a prize. Two lucky winners will receive this bundle, provided by Sew Me A Song. This fat sixteenths bundle is available and was selected for this project and is full of fussy cutting prints. If you buy the bundle and then happen to win, your purchase price will be refunded. The drawing will be held on June 1. 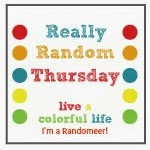 Join in the fun and share your story! I love the idea behind your fussy cut blocks! What a treasure! So sweet! Congratulations on welcoming a new granddaughter! Those are so cool, Cindy. It tells that precious little girl a great story about her grandma. What a great idea to make the quilt back tell your story. Love it and I learned a few more things about you too just by reading this post. I'm right there with you on wearing jeans, mexican food, color, books and black and white. Fun quilt idea: intentional piecing. I'm always *intending* to get the quilts done--does that count? :) Kidding. Great blocks, Cindy! Mad for Solids: It's Time to Vote! !